On April 15th we will present you a new string of the biggest new revelations in techno, a bunch of brand new names from the underground, those who are on the rise and revered by the fans of innovating techno sounds. Dax J is a London born, Berlin based artist, known as a powerful DJ, producer and label boss. In 2015 he released his highly acclaimed debut album ‘Shades of Black’ on his own label, Monnom Black. Mixmag awarded it “Album of the Month”, it reached the No.1 spot on Juno Records with Hardwax describing it as “Brilliantly Banging”. He has released records on seminal labels including: Deeply Rooted House, Soma, Fondation Sonore, Mindtrip, EarToGround, Arts.. Spending the past eight years consistently nailing it in the studio and the DJ booth, Dax J has now got to the top. His trademark sound is on constant rotation with the biggest DJ's in electronic music today. In 2016 Dax was voted into Resident Advisor's top 100 DJ’s of the year at No.56, while also being nominated in Mixmag, Groove Magazine and DJ Mag as Best Breakthrough DJ. He played closing sets at monumental parties including Awakenings for ADE in the Gashouder where he delivered a super strong and legendary set as well as a 10-hour marathon set in the world’s most notorious techno club, Berghain. Degree educated in Music Technology, Dax also runs his own studio in Berlin where he also works as a Sound and Mastering Engineer. With a constant supply of music set to be released and a packed tour schedule around the globe, this UK artist is firmly set for another successful year. 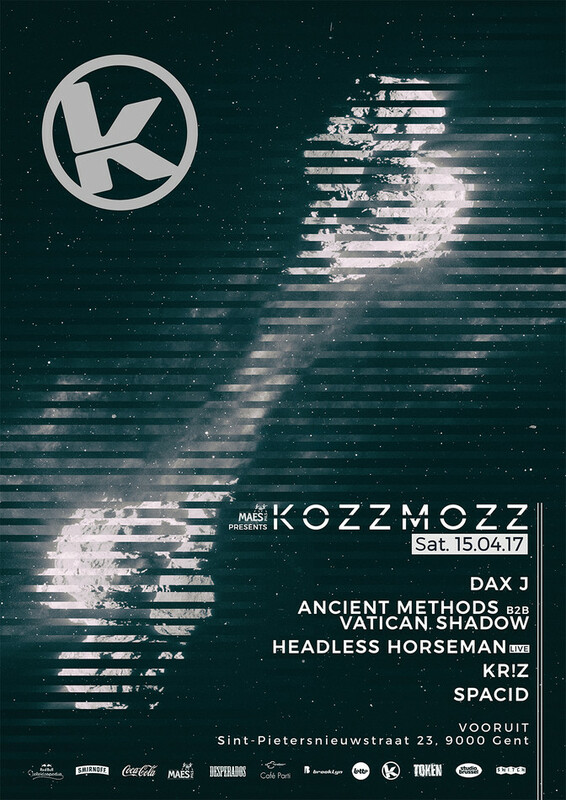 Kozzmozz is honoured to present the the exclusive Vatican Shadow and Ancient Methods B2B tour. They will be doing a very special tour for a period of one month only until May 15th with very selected venues such as Dekmantel, Berghain, RBMA Paris, … and a performance for Kozzmozz. This to highlight a joint release on Vatican Shadow’s Hospital Records which is also celebrating its 20th anniversary this year. There's something about the fearsome crunch of Ancient Methods’ sounds that defies dry technical description and demands that you go over the top, whether in talking about it or moving to it. Which isn't to say they make headbanging music - the "funk" part of their pitch black techno war funk is as important as anything, and their tracks have a good healthy dose of bump'n'grind running through them, even if that grinding is as much angle-grinder as bogling. The raw edges, thick-layered sound and general old-school soundsystem-in-an-industrial-building kick has leapt out amidst the minimal orthodoxy, creating a massive buzz over a few beautifully marbled pieces of vinyl with medieval etchings on the labels, and prompting suggestions of a new industrial forward movement in the techno scene. And now – for a limited time only - he will be teaming up with leading figurehead Vatican Shadow for a new and formidable techno performance. Vatican Shadow is the techno outfit from multi-media artist Dominick Fernow. Melodic loops and martial jagged rhythms juxtapose a sinister and seductive ambience. Vatican Shadow began in 2010, with concrete percussion, luscious synths and metallic drums created by separating stems onto cassettes, which were then re-layered and collaged live. His Hospital Productions label manifested itself as a resource for the most obscure independent music culture from 2006-2011. Over time it has grown from focusing on the local underground scenes of New York to become the home for the debut LP by Silent Servant, a vinyl series by Alessandro Cortini, and a collaborative Vatican Shadow full-length with Function. Through over 500 releases ranging from the apocalyptic to the sublime, Hospital Productions has built a catalog and cult following bordering on downright fetishism that expresses and supports a global vision with singular curation. Prurient’s live sets are renowned for their heady atmospheres, dark-textures and oppressive techno. Here he will be teaming up with Ancient Methods for a new and intrepid performance, putting the two techno-icons together for the first time. We are also very pleased to have the masked man, Headless Horseman make his debut for us here at Kozzmozz. Headless Horseman, a very mysterious producer, has cemented his place as one of the most exciting acts you'll dance to. His dark, raw, and rhythmic IDM-flavored techno only appears on his own label of the same name. Hardware-only shows at places like Berghain and Boiler Room Berlin have showcased the Horseman’s insurmountable skills and now the anonymous producer and performer points his sword at Kozzmozz, ready to slay the voyager masses with a killer live set which will sound major on our infamous sound system. The night starts off with our resident Spacid. Next to guiding the Kozzmozz spaceship into new and unexplored territories on each new occasion, you can regularly catch him on various parties and festivals around the country. He has been promoting techno since the early 90’s but never ties down to one particular style. He thinks outside the box and takes you to a variety of moods. His creative touch is owned by himself and is never a cheap copy. Both his reverence for the past and his quest for innovation transpire in his work as a dj. His thirst for renewal is illuminated by his passion for music, which keeps him sharp. Join our trip across the ever expanding depths of our techno Universe.